We’d love your help. Let us know what’s wrong with this preview of A Load of Hooey by Bob Odenkirk. Bob Odenkirk is a legend in the comedy-writing world, winning Emmys and acclaim for his work on Saturday Night Live, Mr. Show with Bob and David, and many other seminal TV shows. 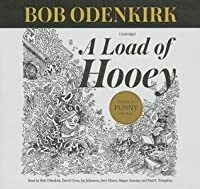 This book, his first, is a spleen-bruisingly funny omnibus that ranges from absurdist monologues (“Martin Luther King, Jr’s Worst Speech Ever”) to intentionally bad theater (“Hitler Dinner Party: Bob Odenkirk is a legend in the comedy-writing world, winning Emmys and acclaim for his work on Saturday Night Live, Mr. Show with Bob and David, and many other seminal TV shows. This book, his first, is a spleen-bruisingly funny omnibus that ranges from absurdist monologues (“Martin Luther King, Jr’s Worst Speech Ever”) to intentionally bad theater (“Hitler Dinner Party: A Play”); from avant-garde fiction (“Obituary for the Creator of Madlibs”) to free-verse poetry that's funnier and more powerful than the work of Calvin Trillin, Jewel, and Robert Louis Stevenson combined. To ask other readers questions about A Load of Hooey, please sign up. (in the spirit of "Didn't Work For Me", p.25) First of all, let me say that I'm a HUUUUUUGGEEEE fan of Barb Okiedirk. I've read every one of his books. Literally. This is his one book. So, when everyone in my "book club" said I absolutely "had to" read this "classic", I splurged on a library card and went for it. SPOILER ALERT-IT'S TERRIBLE. Page after page filled with words arranged in sentences then grouped in paragraphs. Each chapter is a different "humorous" (spelling?) story with different (in the spirit of "Didn't Work For Me", p.25) First of all, let me say that I'm a HUUUUUUGGEEEE fan of Barb Okiedirk. I've read every one of his books. Literally. This is his one book. So, when everyone in my "book club" said I absolutely "had to" read this "classic", I splurged on a library card and went for it. SPOILER ALERT-IT'S TERRIBLE. Page after page filled with words arranged in sentences then grouped in paragraphs. Each chapter is a different "humorous" (spelling?) story with different characters, and each one only lasts a couple of pages so you never know what's going on or what this "book" is even "about". What was Oden-jerk thinking?? He wasn't! Blah blah blah, a bunch of stuff happens and then there's a comic strip in there somewhere. BIG waste of time. I want my couple of hours back. My boyfriend and I started listening to this and got halfway through and stopped. It was boring and not funny :( disappointing because we love comedy books. 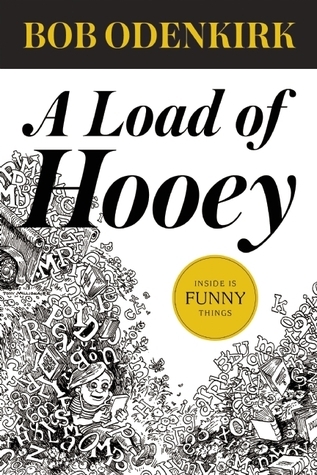 A book that insists on telling you it's funny is a bit like a used-car salesman who calls himself Honest John. 3.5☆ quick read, pretty funny stuff. If you like absurdity there's plenty to enjoy. I laughed out loud at one part about chocolate cake. This book was published in 2014, but I couldn't help thinking of "the most beautiful piece of chocolate cake you've ever seen." Audio sktch comedy. funny stuff. and then put it on request. A LOAD OF HOOEY is a collection of random musings, skits, poems, and anecdotes from Bob Odenkirk. From a long soliloquy about Christmas to a ‘free speech’ that the reader can use for ‘any occasion’ to supposed unabridged quotes from some of the greatest minds of all time, Odenkirk strings them all together (and more) and puts them in a neat little package. And that neat little package is, like I said, very funny for the most part. While there were a couple of clunkers (they can’t all be winners), overall I was laughing in varying degrees as I made my way through this book. It’s mostly incredibly absurd, sometimes absolutely biting, and other times downright whimsical. My utter favorites were the ‘free speech’ essay, the obituary for the creator of mad libs (yes, it does get as absurd as you would imagine), and the expanded quotes that were interspersed throughout the book. And like I said, I had to read a few of the parts out loud for my husband, because I knew this humor was right up his alley. I think that it might come off a little odd to people, but honestly as a fan of MONTY PYTHON I found it absolutely delightful and perfectly madcap. Plus it was a very fast read, and it was a pretty good light read after a heavy book like HOW IT WENT DOWN. This isn't the sort of book I would typically gravitate to, but I received it as a gift. I found the stories to be somewhat repetitive, but I laughed out loud regularly, which is, I think, the point. A few chuckles, but mostly quite painful. It’s a shame, because I loved Odenkirk’s work in ‘Breaking Bad’. A load of hooey indeed. Quick, easy book I actually laughed out loud while reading. Which really, hardly ever happens, especially when a book claims to be funny. In diesem Buch gibt Bob Odenkirk, wohl am bekanntesten als Anwalt Saul Goodman in den Serien „Breaking Bad“ und „Better Call Saul“, Kurzgeschichten und Gedichte zum Besten. Vom Plädoyer gegen das Bücherlesen auf der Toilette über eine möglicherweise stattgefundene Begegnung mit Gott bis hin zur schlechtesten Rede, die Martin Luther King Jr. jemals gehalten hat, werden Leser und Leserin kopfüber in einen Humor gestürzt, den es auf unserer Seite des Atlantiks noch viel zu selten gibt. Worum geht’s? In diesem Buch gibt Bob Odenkirk, wohl am bekanntesten als Anwalt Saul Goodman in den Serien „Breaking Bad“ und „Better Call Saul“, Kurzgeschichten und Gedichte zum Besten. Vom Plädoyer gegen das Bücherlesen auf der Toilette über eine möglicherweise stattgefundene Begegnung mit Gott bis hin zur schlechtesten Rede, die Martin Luther King Jr. jemals gehalten hat, werden Leser und Leserin kopfüber in einen Humor gestürzt, den es auf unserer Seite des Atlantiks noch viel zu selten gibt. Sinn hat das ganze nicht, das gibt der Autor selbst zu, und soll es auch nicht haben. Außer vielleicht, Dinge und Menschen auf die Schippe zu nehmen, bei denen es man sich eigentlich nie traut und… wildes Gelächter. Im Stile des Kapitels „Hat mich nicht überzeugt“ aus Bobs Buch beginne ich mal mit den Worten: Ich bin ein RIESIGER Fan von Bob und seiner Arbeit, aber dass er ein Buch geschrieben hat, ging voll an mir vorbei! Im Ernst, ich liebe Bob Odenkirk und die Rollen, denen er Leben einhaucht. Nun ein Buch von ihm zu lesen, war wohl das Riskanteste, was ich dieses Jahr getan habe — Götzenverehrung und so. 😀 Der Klappentext lockt, das Cover ebenso, und hach, dieser grüne Seitenschnitt! Doch leider, leider konnte ich mich überhaupt gar nicht mit Bobs Humor identifizieren. Natürlich, an ein paar Stellen habe ich geschmunzelt, doch von den Abschnitten „Berühmte Zitate, ungekürzte Fassung“ (bei denen darum geht, bekannte Zitate humorvoll zu erweitern und zu zeigen, dass das eigentliche Zitat aus dem Kontext gerissen wurde), bei denen gefühlt jedes Zitat um ein „Ach, auch egal“ erweitert wurde, bis hin zu Theaterstücken über Hitler oder professioneller Tattoo-Motiv-Beratung war mir irgendwie viel zu wenig „hihi“. Das „wilde Gelächter“, das mir auf dem Klappentext versprochen wurde, habe ich schmerzlich vermisst. Eingestreut zwischen die Texte sind Cartoons, die irgendwie nichts mit dem Text zu tun haben, sowie ein merkwürdiger, mehrseitiger Comic. "Der mittlere Bauchmuskel auf der linken Seite […] heißt Terrence. Es ist ein Respekt gebietender Muskel. Er spannt sich jedes Mal, wenn ich einen Artikel über die Erderwärmung lese." Jedoch muss ich sagen, dass die Sprache und der Schreibstil mir sehr gefallen haben und ich bei der Lektüre von „Jede Menge Mumpitz“ auch Bobs Stimme (bzw. die des Synchronsprechers) im Kopf hatte. (Vielleicht gibt es das Ganze ja demnächst als Hörbuch, gesprochen vom Autor?) Die 174 Seiten waren hin und wieder mit etwas persönlicheren Geschichten gespickt, die mir am meisten gefallen haben und die wohl auch teilweise im New Yorker als Kolumne erschienen sind. Diese etwas weniger albernen Kurzgeschichten waren vom Stil und auch vom Humor her irgendwie etwas komplett anderes, und davon würde ich sehr gerne mehr lesen! Highlights waren „Louvre-Audiotour für Hauseigentümer“, „Mein Waschbrettbauch“ und „Zukunftsvision“. In letzterer Kurzgeschichte gibt es auf der Welt nur noch glutenfreie Lebensmittel und die Menschen leben ein sorgenfreies Leben, da sie nicht mehr umständlich überall nach den Inhaltsstoffen fragen müssen. Listened to this on a long car ride with my teen. We are both big Odenkirk fans. There were some flashes of brilliance here, but mostly this was just a series of ideas that had not yet been polished or edited. The whole audiobook is less than 3 hours long, and we got a few laughs, but I can't say I am urging anyone to read this. The Second Meeting of Jesus and Lazarus: "What's that? If I believe in you I will live forever? So, then I won't die? Oh, so you're saying 'figuratively' I will live...in some heaven somewhere? What's that like? What happens there? An amusing collection of skits from a gifted writer and actor. Some definitely better than others, amongst my favourites were: "Unabridged Quotes" from famous people throughout history; "Her Laughter"; "I Think I Just Met God" (a Moses, or similarly, Joseph Smith, parody); "What I'm Looking For in Another Man"; and "Shakespeare in the Park." All in all, A Load of Hooey is a nice, light diversion. I hate giving bad reviews. I got this book because I love Saul on Breaking Bad and on Better Call Saul and know he is a writer for the latter. However, the book only made me laugh a few times. There were some very witty things, but overall I think I just didn't get some of it. My book group just did short stories and they didn't get/like the collection we read, now I know how they feel. It's probably me, not Mr. Odenkirk. I was excited and expected so much funnier. A fun, extremely quick book of humor in the style like Steve Martin's Cruel Shoes or Jon Stewart's Naked Pictures of Famous People. Too short, really. I wish there was more in here. I got the hardback and it's really well put together, worth getting it in your hands. The cover and some inset illustrations by Tony Millionaire were a pleasant surprise to this Maakies fan. Very funny, entertaining, and short audiobook. My favorite piece is the prisoners voting to perform Shakespeare in the Park. This book is appropriately named. Some fun stuff, some not so much. The "not so much" was mostly sketches that I just didn't get, or that went on for a bit too long after I'd gotten the idea already. It comes down to personal taste, of course, but I think some of the skits may have benefited from being shown instead of just read. It was nice to hear as an audiobook, especially for Jay's performances. He was really into it. And it's nice to hear those people working together, no matter what on. The poems were probably the funniest Some fun stuff, some not so much. The "not so much" was mostly sketches that I just didn't get, or that went on for a bit too long after I'd gotten the idea already. It comes down to personal taste, of course, but I think some of the skits may have benefited from being shown instead of just read. I like how short each chapter is. I like that each chapter is entirely independent. I like that it's funny. Well, I'm going to say it's 4/5 on the laugh-o-meter. It was laugh-out-loud funny when I was at home. However, when I was reading part of it on an airplane, I was able to impose my will to hold in laughs with no sign of chuckling. But I was laughing on the inside. So it's "laugh-out-loud funny," but not "uncontrollable-laughter funny." The tempera I love it. Well, I'm going to say it's 4/5 on the laugh-o-meter. It was laugh-out-loud funny when I was at home. However, when I was reading part of it on an airplane, I was able to impose my will to hold in laughs with no sign of chuckling. But I was laughing on the inside. So it's "laugh-out-loud funny," but not "uncontrollable-laughter funny." The temperature is just right. This book is like a constantly funny version of the types of books I write. Mine, occasionally funny and often true. His, constantly funny and likely entirely fiction. I think I just really like extremely short essays. There was definitely some fun humor in this - a collection of humor, but overall I just got tired of it about half way through. It jokes about it NOT being a bathroom read and how bathroom reads are terrible, but that is exactly what this is. Short little bits to be taken individually. My favorite was the section of critical Amazon reviews of things like "The Mona Lisa", "The God Father", or "The Bible" - funny and accurate. I may pick it up again someday, but i'm good for now. Read by me in one sitting this morning (I woke up early), this is a very funny book that's pure absurdist Odenkirk. The stream of vitriolic humor that's run from Mr. Show through his work and onto the pages of this book will make you want to read it on the toilet, despite the exhortations not to at the beginning (or, really, before the beginning). Good stuff - if you like Bob Odenkirk, you will enjoy his book. Essays felt very uneven. A few were clever and witty (e.g., the Mad Libs inventor's obituary and the various "unabridged" quotes), but many seemed bogged down with sophomoric jokes involving bodily functions. 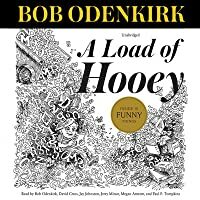 Odenkirk is clearly a very intelligent man with a wonderfully unique perspective on life, but this book seemed unable to settle on a target audience - was he writing for frat boys, or for intellectuals with a dark sense of humor? Robert John "Bob" Odenkirk (born October 22, 1962) is an American actor, comedian, writer, director, and producer. He is best known for being the co-creator and co-star of the HBO sketch comedy series Mr. Show with Bob and David and for his role as criminal lawyer Saul Goodman on the AMC crime drama series Breaking Bad and its upcoming spin-off series Better Call Saul. In the 1980s and 1990s, Odenk Robert John "Bob" Odenkirk (born October 22, 1962) is an American actor, comedian, writer, director, and producer. He is best known for being the co-creator and co-star of the HBO sketch comedy series Mr. Show with Bob and David and for his role as criminal lawyer Saul Goodman on the AMC crime drama series Breaking Bad and its upcoming spin-off series Better Call Saul.